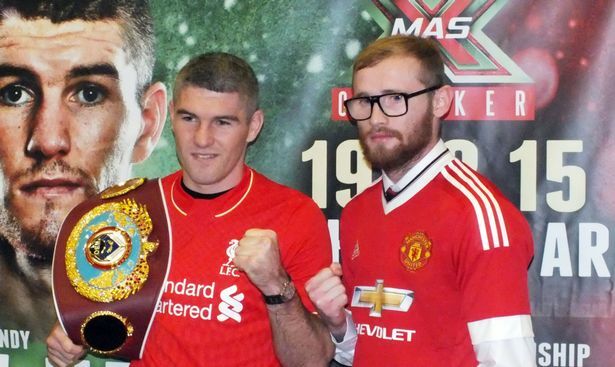 Having won the family race to a world title, WBO World Super-Welterweight Champion Liam Smith wastes no time attempting to cement hegemony as the finest of the four fighting Scouse siblings by making a rapid voluntary defence on December 19th, writes Glynn Evans. The 27 year old they call ‘Beefy’ returns to the Manchester Arena – where he spectacularly nailed New Jersey artist John Thompson to the canvas in round seven to bag the vacant crown in October – to square off with unbeaten home town hero Jimmy Kilrain Kelly, exclusively live on BoxNation. ‘Winning a world title was just the best feeling a boxer could ever have,’ says Smith who is undefeated in 22 (one draw, 11 stoppages). ‘My lot were very, very vocal and the atmosphere was brilliant. I couldn’t have asked for better. I tried to downplay Thompson’s achievements beforehand so as to limit his confidence but he was probably the best I fought. He arrived on a high after beating a couple of very good kids and had won the prestigious Boxcino Tournament – far more meaningful than Prizefighter. He was a big, gangly, awkward lad that I could’ve looked bad against. After eldest brother Paul twice faltered in WBO Super-Middle challenges, 5ft 9 ½ in ‘Beefy’ finally got the family across the world championship line. ‘To be honest, little has changed since I became world champion,’ says Liam, second youngest of the world rated quartet who have all won British titles. Whilst the WBO 11st listings are presently littered with top grade and highly sellable contenders such as Alvarez, Soto, Trout, Andrade, Martiroysan and Clottey, the ambitious new champ already has designs on unifying his belt. He explains: ‘The WBC belt is presently vacant and (IBF king Jermall) Charlo and (WBA boss Erislandy) Lara are both coached by Ronnie Shields so aren’t going to fight each other. So for unification to happen any time soon, they have to come through me. With just 70 days splitting his coronation and his maiden defence, Smith knows he could collect unwanted attention as one of the shortest reigning champions in the history of the sport, were he to fluff his lines against the sprightly former five-time national junior champion in Manchester next weekend. ‘There’s no added pressure. I’d be just as gutted if I lost to Jimmy Kelly in a British title fight, as for my WBO belt. But that ain’t happening,’ dismisses Liam. ‘People forget, Kelly wasn’t mandatory. It was my choice to fight him and I selected him for a reason. My aims are far higher than Jimmy Kelly. ‘But I’m definitely not underestimating him. I’ve got (ex WBO middle king) Hassan N’Dam N’Jikam and Tommy Langford in as sparring; two super fit kids who’ve cost me a bomb. Does that suggest I’m taking Kelly lightly? When I hit the scales, everyone will see what fabulous shape I’m in. And the man with the milk curdling scowl expects to be celebrating Christmas 2015 with a huge smile on his face. ‘Look, Jimmy’s a good prospect and I expect he’ll be quite competitive early on,’ he concludes. ‘But this is far too soon for him and I’ll prove I’m the better fighter when it starts getting tough, mid rounds. I’ve been there before. The Channel Of Champions, BoxNation, will televise Daniel Jacobs v Peter Quillin live and exclusive on Sky 437/HD 490, Virgin 546 and Talk Talk 415. Subscribe at www.boxnation.com Or watch online at Livesport.tv and via iPhone, iPad or Android.